Frozen fingers while giving ice therapy massage at home can be a big problem. 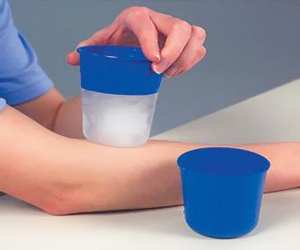 Cryo Cup is an ideal icer for quick and easy use at home and clinic. Just fill it with water and freeze. Then use by holding it from handle which is not cold as it is made of cool retardant material.